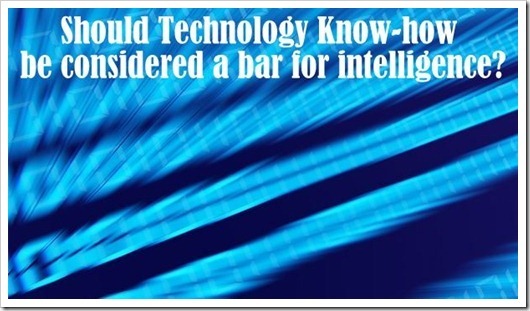 Should technology know-how be considered a bar for intelligence? Be it the television in front of us or the fridge in our kitchen. Be it the latest microwave to the latest washing machine. Laptops, computers, post-PC devices et al. And of course, the gadget of all gadgets – Mobile. Saying that we live in a world filled with gadgets small enough to fit in our pockets to Space stations is not an understatement. Everything is gadgets in some form or the other. Microchips have invaded our lives so deep that life without them seems almost as difficult as some of the basic necessities. The dependence is out in the open with a small failure in working of these gadgets result in losses of the order of millions for companies. This dependence of course means that people who were born before this mayhem need to learn to adjust and the one who are born in the eye of this great storm start fiddling with smart phones and tablets before leaving their diapers. This new generation is so well verse that it seems that people who are not able to tell right from left in a smartphone are essentially baboons who should get training first. But is it really so? Is knowledge of how to get along with technology a measure for intelligence? Is a person who is struggling with technology a waste resource and a tech-savvy person a minimum requirement? We have also heard that technology is making us stupid. Is this true? I believe that the answer to both these questions is one – No. Because of one simple reason- Knowledge of how to use technology is not a bar for intelligence and should not be used as such. Unfortunately, it is used as such on more than one occasion. If a person does not know Android he is looked upon as if he is a n00b (a newbie) and a kid. If a person fumbles or struggles with a computer he is of no use. But this is not the case. With every technology there comes a learning curve and the problem is not the intelligence but the reluctance to follow the learning curve. This process of learning something completely new becomes a tedious process and akin to an uninterested student, the person digresses. Coming to the second question, this is often raised that technology is making us stupid. There are even numbers sometimes shown to support that. I believe though that the tests are flawed. They still want to test a skill in person that no longer is needed. We are evolving beings and though most evolutions are slow that does not mean that we stop. Technology has given us a method to store information readily at hand. Thus remembering all of it is not a necessity. People now cannot remember more than a few numbers because there is no need for more than that. Google Play store opens paid apps for Indian Developers! Knowledge of technology although is not a necessary yardstick of some one's intelligence it is definitely a good measure of some one's drive to keep up with technology to become more productive in what he does. There is not a field of work today, which you cannot better at by using technology. I get pissed off when I meet executives who need to know some technology (Not Hitech, talking about basic Office Stuff) but have shyed away from it, and mind you these guys are very good Business People.. So to sum it up, although not a necessity every one needs to know enough to get better. I’d agree with you if you’re talking about raw intelligence. Technology is necessary to make life better, and I don’t think it is a great idea to ignore it to stretch one’s mind. It is just that the mind is being used differently these days. Consider the case of fly-by-wire jets. Inputs sent by the pilots are fed to a computer to ensure error-free flying, but that doesn’t mean we can do away with pilots. The pilots can hone their intelligence for the next evolutionary stage in aviation technology, and need to work extra hard to be prepared in the event of a breakdown of automated systems. I agree with you Naweed. Technology is essential to us now. It though does not make a person smart or stupid. That is my belief.